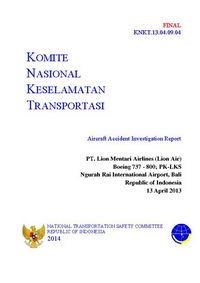 A Boeing 737-800 passenger plane, registered PK-LKS, suffered an accident at Bali's Denpasar-Ngurah Rai Bali International Airport (DPS) in Indonesia. There were 101 passengers and seven crew members on board. All aboard survived. Flight JT-904 departed originated at Palu Airport (PLW), Indonesia and was bound for Denpasar (DPS), Indonesia with en route stops at Balikpapan Airport (BPN), Banjarmasin Airport (BDJ) and Bandung Airport (BDO). The flight departed Bandung at 13:45 with the copilot as Pilot Flying. About 15:00 the flight was descending towards Bali and the crew received vectors for a VOR DME approach for runway 09. At 15:08, with the aircraft at approximately 1,600 ft AGL, the Tower controller saw the aircraft on finals and gave a landing clearance with additional information that the wind condition was 120° at 5 kts. While descending through 900 feet the copilot stated that the runway was not in sight. Since the captain noted a flashing light at the beginning of the runway, he responded: "OK. Approach light in sight, continue". At 15:09:33, after the EGPWS called out "Minimum" at an altitude of approximately 550 ft AGL, the pilot disengaged the autopilot and the auto throttle and continued the descent. The airplane then entered an area of rainfall and the outside environment became totally dark. At 150 ft AGL the captain took over control. The copilot handed the control to the captain and stated that he could not see the runway. At 15:10:01, the EGPWS called out "Twenty", and the captain commanded a go around. One second later the aircraft impacted the water. The aircraft stopped facing to the north at about 20 meters from the shore or approximately 300 meters south west of the beginning runway 09. - The aircraft flight path became unstable below minimum descends altitude (MDA) with the rate of descend exceeding 1000 feet per minute and this situation was recognized by both pilots. - The flight crew loss of situational awareness in regards of visual references once the aircraft entered a rain cloud during the final approach below minimum descends altitude (MDA). - The PIC decision and execution to go-around was conducted at an altitude which was insufficient for the go-around to be executed successfully. - The pilots of accident aircraft was not provided with timely and accurate weather condition despite the weather around the airport and particularly on final approach to the airport was changing rapidly. The operator should review and ensure the effectiveness of current CRM training program and CRM practices. The operator should review and ensure the effectiveness of current Safety Emergency Procedure particularly evacuation procedure. The DGCA should oversight all air operators in achieving the effectiveness of training programs for the pilots to be competent in hand flying and covered during pilot initial training and recurrent program. Distance from Bandung Airport to Denpasar-Ngurah Rai Bali International Airport as the crow flies is 857 km (536 miles).